This thesis investigates the in-situ series connection, a new method to implement monolithic series connection into amorphous silicon photovoltaic modules on flexible and rigid substrates. Also the thesis presents a novel circuit for dynamic string and module interconnection. 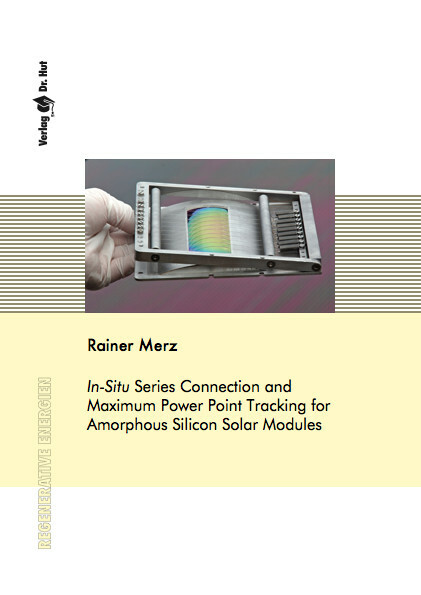 To manufacture amorphous silicon solar modules more easily and cost effective, the in-situ series connection replaces the state-of-the-art ex-situ laser scribing process for monolithic series connection. The maximum power point tracker for dynamic string and module interconnection optimizes the output power of photovoltaic systems. The investigation of the in-situ series connection deposits ten amorphous silicon solar cells interconnected to a module on a flexible polymer foil. The results of the investigations successfully demonstrate the high quality of the in-situ series connection method. The first experimental implementation of the in-situ series connection yields a flexible photovoltaic module with an efficiency η = 3 % with interconnection losses of F = 15 %. Masking wires pattern all constituting layers of the thin film solar cells during their subsequent deposition steps. Appropriate wire shifts provide electrical isolation and monolithic series connection of the single solar cells into a photovoltaic module with an open circuit voltage V oc = 9 V. The wire set initially patterns the back contact, a first wire shift masks the back contact during the cell deposition and a second one opens the back contact to provide series connection during deposition of the transparent front contact. The thesis further includes experiments to optimizes the wire patterning with respect to its implementation into roll-to-roll deposition setups. The development of a wire frame, which is compatible to a reel-to-reel cassette for continuous roll-to-roll layer depositions, prepares investigations towards industrial implementation of the in-situ series connection. Experiments with different diameters of the masking wires investigate the minimum dead area of the in-situ series connection. The theoretical limit of the interconnection losses as low as 7 % is calculated from the findings of the patterning experiments. Further, the study figures out a tolerance against mechanical misalignments of about 50 μm without effecting the theoretical minimum interconnection losses of 7 %. Taking measures to increase the mechanical tolerance, however, increases the dead area of the modules and also the limit of the theoretical minimum losses. High efficiency amorphous silicon photovoltaic module fabrication uses tandem or triple cell structures. The thesis calculates interconnection losses of 5 % for the use of amorphous doped layers for tandem cells and studies the effect of shunts due to nanocrystalline doped layers on the interconnection losses. For the use of nanocrystalline p-type layers, the fundamental calculations result in 13 % interconnection losses and for the use of nanocrystalline n-type doped layers instead of amorphous ones, the interconnection losses are 17 %. For the use of nanocrystalline n-type and p-type doped layers, the study again calculates also minimum interconnection losses of 17 %. Further studies figure out that the preferred implementation of the masking wires directly into the deposition setups allows for absolutely shunt-free manufacturing of multi-junction modules. Moreover, the wire implementation does not need any tunnel junctions at the interconnection gap of the in-situ series connection and the minimum interconnection losses for the use of nanocrystalline doped layers drops to 5 %. Additionally the integration of the wires into the deposition chambers does not need any wire shifts and allows for module production from the empty substrate to the finished module completely in the vacuum.